The book gives an introduction to \(p\)-adic numbers from the point of view of number theory, topology, and analysis. Compared to other books on the subject, its novelty is both a particularly balanced approach to these three points of view and an emphasis on topics accessible to undergraduates. In addition, several topics from real analysis and elementary topology which are not usually covered in undergraduate courses (totally disconnected spaces and Cantor sets, points of discontinuity of maps and the Baire Category Theorem, surjectivity of isometries of compact metric spaces) are also included in the book. 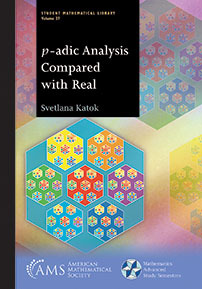 They will enhance the reader's understanding of real analysis and intertwine the real and \(p\)-adic contexts of the book. The book is based on an advanced undergraduate course given by the author. The choice of the topic was motivated by the internal beauty of the subject of \(p\)-adic analysis, an unusual one in the undergraduate curriculum, and abundant opportunities to compare it with its much more familiar real counterpart. The book includes a large number of exercises. Answers, hints, and solutions for most of them appear at the end of the book. Well written, with obvious care for the reader, the book can be successfully used in a topic course or for self-study. Undergraduate and graduate students interested in \(p\)-adic numbers. ...the book gives a good impetus to students to study the "p-adic worlds" more deeply. This role of the book is not only supported by carefully selected material but also by the fact that it is written in a very lively and lucid style. I think that the reading of this book could animate some students to start to do research \(p\)-adic work. A good decision from my point of view!